Using traditional outdoor grills are not easy for the novice. An electric grill is a good option those who do not want to have grilled food without much effort. Electric grills are the best alternative to the outdoor charcoal grills as they produce grilled items similar to traditional grills in texture. Instead of using charcoal or propane gas for heating the cooking plates, these grills use electricity as the heating source and are way cheaper than using charcoal. The various brands of electric grills available in the market are capable of giving an even distribution of heat and hence evenly cooked food items and ease of use. Whether you want to cook for the members of your family or for conducting barbecue night for your friends or neighbors, electric grills is a good choice as they do not produce smoke like the traditional grills. Having some basic information about the construction and working of the electric grills will make it easier for you to use it. An electric grill usually comes with a heating element which is either embedded in the cooking surface or placed below the cooking surface. The heating oil is made of an alloy of nickel and chromium. When the electric current passes through the coil the alloy resists the electrical flow and gets heated. The heating element produces a constant heat to cook the items placed on the cooking surface. Some of them come to the tilted surface so that the excess fat and juices coming out are easily collected in the drip pan placed on the front side. The non-stick cooking plates make the food grilled healthier as the food can be cooked without applying oil or butter on them. The grills have grooved grates which will direct the grease and fat away from the food you are grilling. Some of the grills come with removable plates which can be taken out for cleaning. Grills with fixed plates can be cleaned by wiping the nonstick surface. Electric grills are available in different sizes, shapes, styles etc. there are outdoor models, indoor models, outdoor/ indoor models. Outdoor models are usually larger than the indoor models which can be placed on the kitchen counter. There are even models which come with pedestals, wheels, etc., to offer portability and convenience. Based on the construction there are two different types of electric grills: the open grill and contact grill. The open grill is similar to the traditional outdoor grills in appearance and has a single grate for placing the food. A contact grill has two heating plates and the food is kept between these plates to grill it. The open type grill can get much hotter than the contact type grills. You need to connect the electric grill to an electric outlet to get it work. 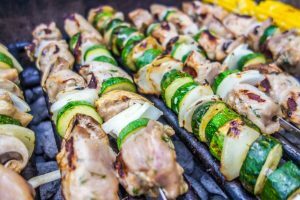 If you are using the electric grill on an outdoor area you need to consider the models with a long cord or you will need to use extension cords. If you have any doubt regarding what temperature to use in your electric grill it is better to set the temperature at 400 degrees F. Most of the indoor grills which come with automatic heat control heats up to 4000 F.
After preheating the grill to the desired temperature or till the grill shows the ready light, place the food to be grilled on the plate using tongs. On contact grill, place the food items on the center part of the lower plate and close the grill and put the lock. Allow the food placed on the grill to cook half way, according to the item placed on the grill and flip the food once to allow even cooking. Remember that vegetables and pre-cooked food items take lesser time to cook than the raw meat. The cooking time needed for meat is about 20 minutes. 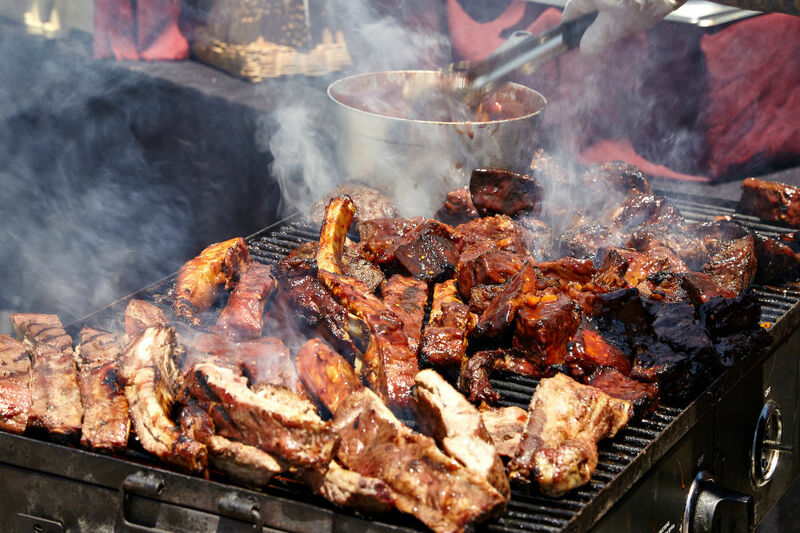 Once the food is done evenly, remove from the grill using tongs. After cooking, unplug the grill and allow the grill to cool completely. In the case of contact grill, keep the plates open so that it gets easily cooled. Once the grill gets cooled, remove the grate and drip pans and wash or wipe the grill using a wet sponge and dish wash soap. Allow the grill to air dry before using the cover to protect the grill. If you do not have experience in using grills for cooking, it is necessary to go through the instruction manual provided by the manufacturer and understands the different components and working on the grill before trying to start it for cooking purposes. You need to know about the temperature control and timer settings of your electric grill if you want to achieve perfection in grilling. Though the models with temperature controls are a little more expensive, they are good for getting the best results while cooking. Always follow the instruction provided by the manufacturer so that you will be able to cook the food in an optimal way and to increase the life of your equipment. Go through the warranty terms and conditions. Never try to repair the equipment by your own. If something goes wrong within the warranty period approach the manufacturer for the getting the parts replaced or to repair the item. Always make sure that you get the product from the well known manufacturer and from reliable stores.